Part of colorful display in a downtown store. 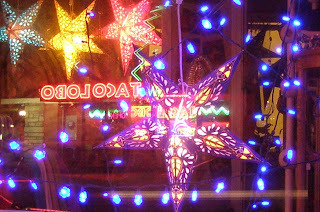 Neon of restaurant across street reflected in window. Art and color are nice even though I don't need to do Christmas shopping. Have wondered if the term "Black Friday" was a Freudian slip. One of the biggest shopping days before Christmas, but also implies negative as in the Black Tuesday of crashing stock market fame in 1929. Today, the radio says it means wishing to be in the black for merchants, rather than in the red. One side effect of rising property values is the fact that retailers must move more merchandise to pay the rent and pay their employees so they can pay the rent. These numbers aren't exact but it's the general idea. In 1965, it would only take 84 TVs, at $300 apiece, to buy a $25,000 house. In 2005 it would take an amazing 1166 TVs, at $300 apiece, to buy that same house priced at $350,000. No wonder the products must keep moving or else the house payments and / or rents aren't paid. Part of the Black Friday analysis also is because of taxes. The average American works almost a full 5 months to pay their tax burden. I love your TV comparison. Put another way, back in the 1950's, acquiring a television meant a big splurge--a larger proportion of your total net worth. Nowadays people can buy a new $300 LCD TV on a whim. After all its such a small proportion of their debt! (The old broken three-year-old TV of course gets chucked into the landfill).